Yesterday, Calais was cold, windswept and raining. 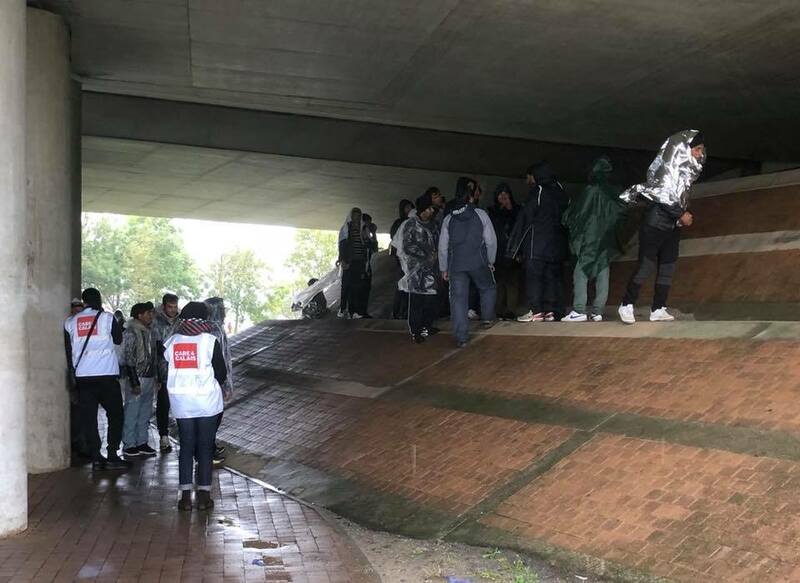 People were huddling under bridges to get out of the rain and shivering from the cold. We gave out 41 pairs of walking boots, together with winter coats, hoodies, sleeping bags and joggers. One lad in particular was really cold and shivering as he was totally soaked to the skin – he was blue and shaking. Marie, a lovely volunteer, brought him back and searched through our stock to find a good waterproof coat and a change of clothes down to his soaking wet underwear. Our first Care4Calais makeover. A small high point in a miserable day. As the weather gets worse please consider doing something to keep these people warm when they are outside all day. A donation of £20 buys some warm dry walking boots, or last years winter coat will be well used out here.